It's a Scrappy World: Bugaboo Stamps is sponsoring a special Kids Challenge! Bugaboo Stamps is sponsoring a special Kids Challenge! Bugaboo Stamps is sponsoring a very special new challenge! Crafting with Kids is a new monthly challenge intended to inspire childrens creativity with paper! This month's challenge is to make a gift or Valentine craft with your kids. I am so excited to share this challenge project featuring Bugaboo Stamps Deacon Heart, and Ava Heart from my own daughter, Annabella! At 5 years old, Annabella has a good eye for color and does a great job staying in lines. Like me, she has been eagerly coloring ever since she was able to grip a crayon! It was only fitting that she used this opportunity to make yet another plea for more of her own Copic markers! 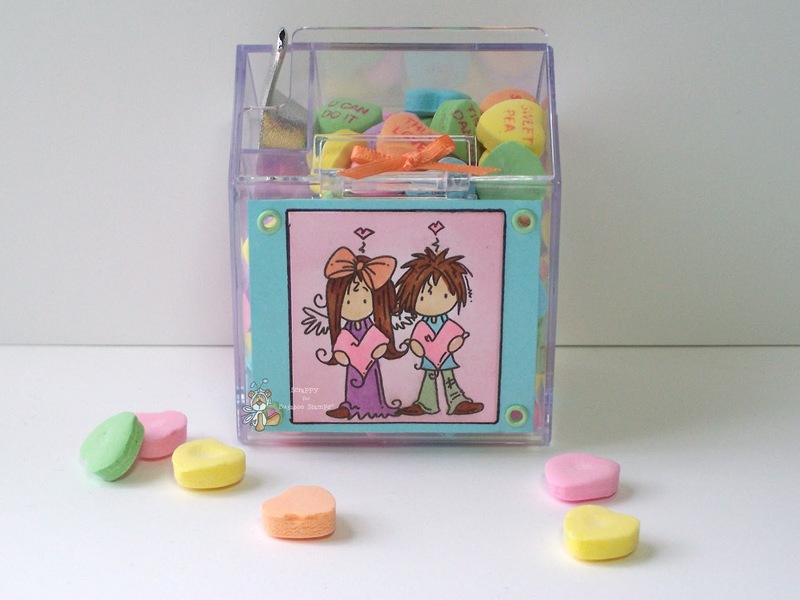 Awesome candy hearts holder. That is so cool. Thank you so much for sharing it with us at 4 Crafty Chicks. Annabella did a wonderful job! It looks fabulous! What an adorable project! Such pretty colors! Thanks for joining the Pixies at Pixie Dust Studio!